Hearing protection for children ~ SOUND IS FUN! 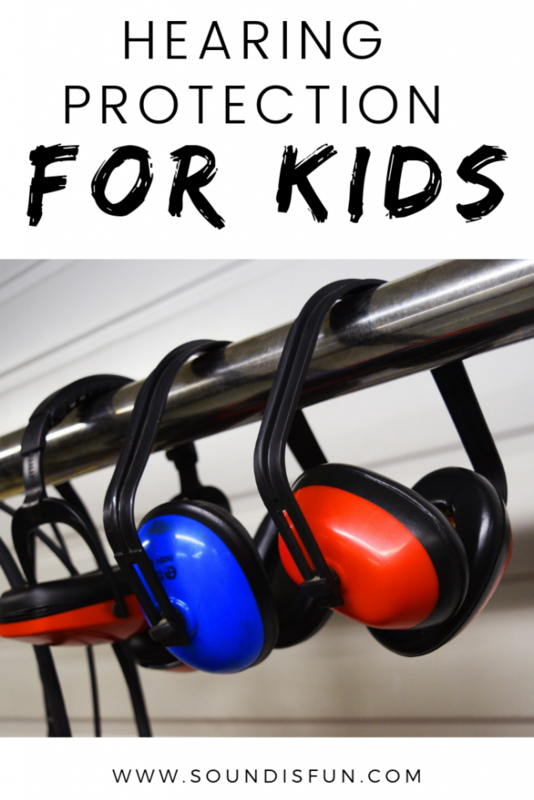 Hearing protection for children of all ages is important because hearing damage from loud sounds is permanent. Children under the age of 5 are more susceptible to hearing damage so it’s especially crucial to protect their ears. The two styles of hearing protection are earplugs and earmuffs. When worn correctly, both earmuffs and earplugs are equally effective. The main advantage of earplugs is they are discreet – they fit in a pocket and aren’t bulky to wear. For babies and toddlers, earmuffs are recommended because earplugs can be a choking hazard. Earmuffs also may be more comfortable for some kids (and adults) who don’t like the feel of a plug in the ear. Proper hearing protection should say the amount it reduces the sound (and has been tested to do so). The rating of most earplugs and earmuffs will be in the range of 20-30 dB reduction. If you feel your hearing protection is too drastic, try looking for something on the lower side (20dB vs 30 dB, for example). For babies and toddlers, Banz Earmuffs are a popular choice. The noise rating is 31 dB which will keep a baby’s ears safe in just about any environment. For kids and adults, Snug Kids Earmuffs have a noise rating is 25dB. They come in different colors and have a 5 year warranty. Mack’s Moldable Silicone Putty Earplugs have a rating of 22 dB. They are also waterproof and can be used for swimming. Mack’s Slim Fit Foam Earplugs have a noise rating of 29 dB. The ear canal is full adult-size at 5 years but some kids may find a slim earplug more comfortable and easy to put in. Why can’t I use cotton balls, tissue paper, clothing or a hat? Materials like these only reduce about 7 dB which is not nearly enough to protect your ears in a loud environment. Hearing protection is usually designed to reduce 20-30dB. Why can’t I just wear noise cancelling headphones at a concert? It’s a good question – but noise cancellation isn’t the same as noise reduction. An earplug (or earmuff) is designed to reduce all frequencies no matter what sound reaches your ear. As long as it’s worn properly, your hearing will be protected. There’s no guarantee noise cancelling headphones will protect you and here’s why. Noise cancelling is just an algorithm that works better with some frequencies and sounds and not at all with other sounds. Low frequencies are reduced more than high frequencies. Noise cancelling works well with steady sounds (like the rumble of a plane or car) but not a dynamic/changing sound. An analogy would be wearing a coat that’s not waterproof vs wearing a rain coat. If it’s only sprinkling you’ll probably get some protection but not as dry as if you were in a raincoat. If it’s raining hard and you’re not in a rain coat, you’re going to get wet. Any sort of physical barrier (whether it’s a jacket to protect from the rain or something covering your ears from a loud sound) is going to be better than nothing. But, since it’s not the right “tool” for the job, it’s not guaranteed to give the protection you need. When do children need ear protection? We cover this in depth here: How loud is too loud for kids? One way to gauge if something is too loud is The 3-feet test. If you are three feet from someone and need to raise your voice for them to hear you, you’re probably around 85dB. 85dB is the threshold of safe listening and anything above this will cause hearing damage with prolonged exposure (anywhere from seconds to hours depending on how loud it is). If you have to yell to be heard, you’re in a sound danger zone. You can also use a sound level meter to check how loud something is. There are apps that are SPL meters but not all are accurate. Sound gets quieter as you move further away from the source. If you’re far enough away, you won’t need hearing protection (so that’s always an option). If you want to be up close at a fireworks show or a concert, hearing protection is the safe way to do that. I highly recommend reading How loud is too loud for kids? for more information. Children under 5 are at more risk of hearing damage than anyone else. Because their ear canals are shorter in length, the sound pressure level in their ears is 10 dB higher than it is for an adult (or young adult). If a child is complaining a sound is too loud or their ears hurt from a sound, don’t ignore it. They really are hearing it louder than you are. 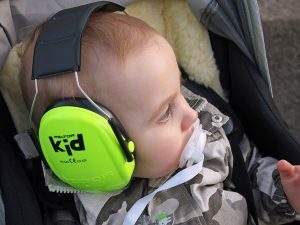 Try to integrate hearing protection early on. If your child get used to wearing earmuffs before they are old enough to protest, you have a greater chance of them wearing earmuffs in the future. Involve your child. If they can, have them help choose earmuffs. There are a lot of colors and patterns to choose from. 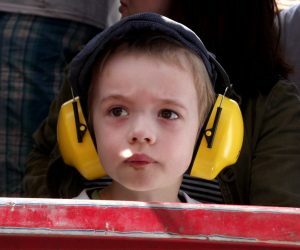 Questions about hearing protection for children? Tried any earplugs or earmuffs? Comment below or contact me!